Bhaktivedanta Manor, in the Hertfordshire countryside just beyond the bustle of London, was built at the end of the 19th century. In 1973 former Beatle George Harrison purchased it for ISKCON. It has become one of the largest and most active ISKCON temple communities in Europe, and on the festival occasions such as Janmashtami, attracts up to 50,000 visitors. There are 80 acres of parkland, lake and gardens. The centre also includes a fully equipped theatre room, a small nursery and primary school, classrooms and a large monastery. In addition, there are Open Days and workshops, community projects for the congregation, and a base for feeding hundreds of disadvantaged people across north London. The temple offers extensive community events and congregational services, including schools and educaton options, youth groups, theater, gift shop, and gardens. 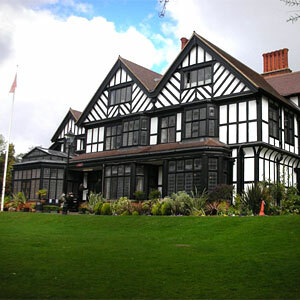 The manor and grounds are also available for weddings and other events on arrangement. Please note that some weekend events may require adjustments in visitor facilities, so visit the website and contact the temple for information. Many more regular events and services available on the website.